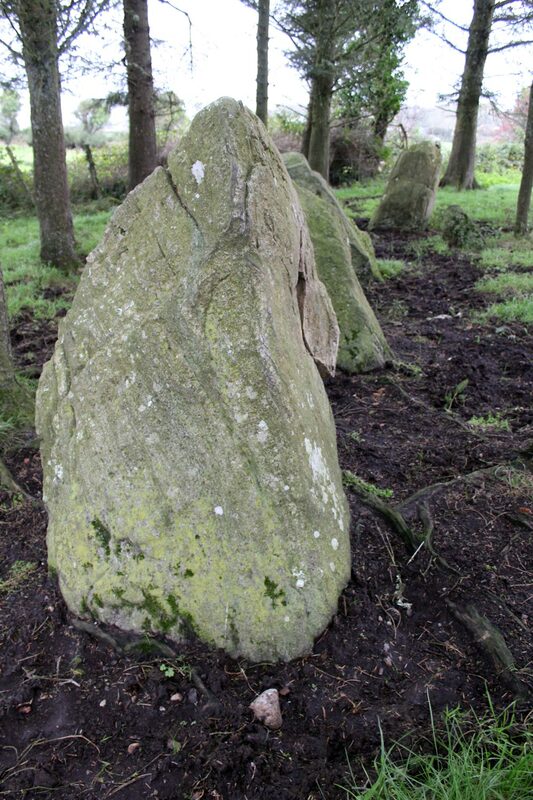 The line of standing stones at Barnasrahy to the north of Carrowmore. Barnarashy is a small collection of monuments 1 km north of Carrowmore. The monuments are on farmland and there is no public access. 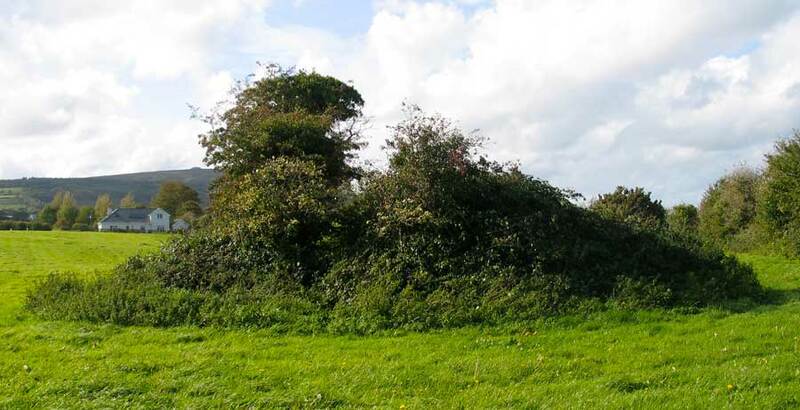 There were at least five monuments here, but now the remains of two are all that can be seen as the site is crossed by a field boundary and extremely overgrown. 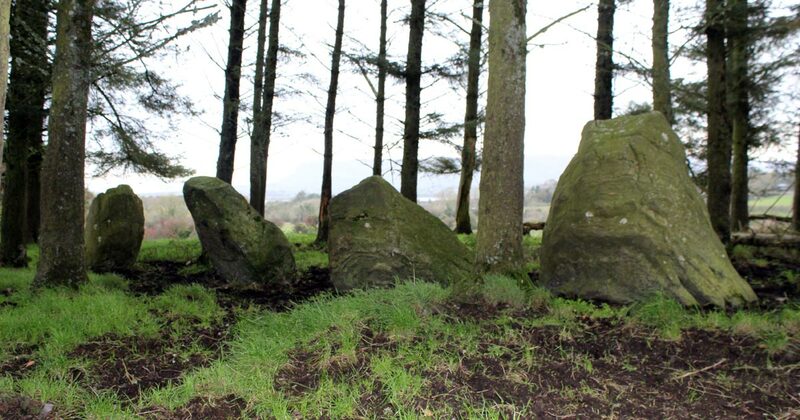 The largest site is the remaining stones of a substantial cairn with a cruciform chamber. The diameter is some 20 meters across, with a chamber 4.5 meters long. Six kerbstones remain in position. The site is cut in half by a ditch and overgrown with bushes and undergrowth, so not much can be seen. It must have been a major monument given that it had a cruciform chamber. Roger Walker excavated the site in the 1830's, and found the bronze age food vessel, illustrated above, which he sold to the Duke of Northumberland. It now resides in Alnwick Castle, along with several other items from Sligo, sold by Walker shortly before his death. Wood-Martin excavated the chamber in 1888, and found the right hand recess to be full of pieces of white quartz. He also found cremated and uncremated bones, charcoal and a hammer stone. 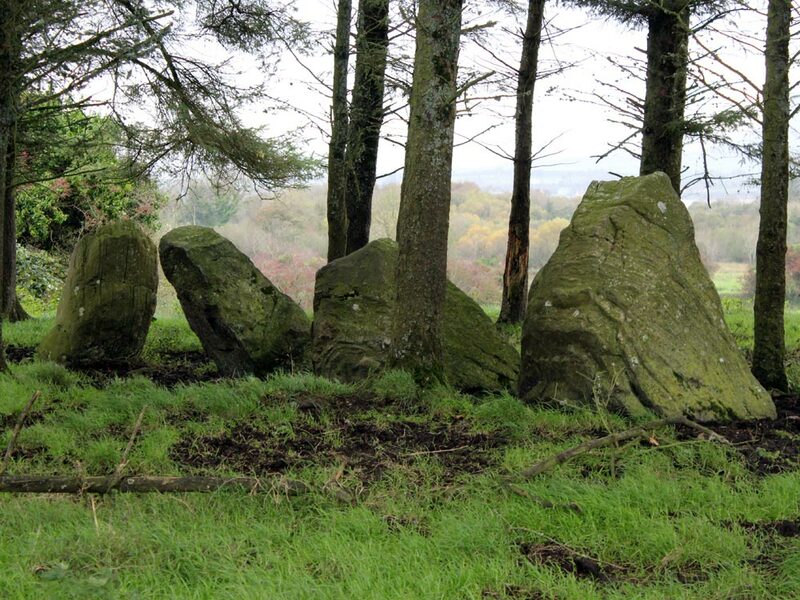 The only surviving monument, shown in the photo above, is a stone row: four large boulders and one offset smaller stone. This row may have a possible alignment towards Knocknarea. Such stone rows have been examined in other parts of the country, and are thought to date to the bronze age. They often point to the rising or setting of a heavenly body. I haven't come across any research suggesting this row has been checked out for alignments. Two more monuments, which may have been cairns or boulder circles were completely destroyed in the past, and may have stood in the field just west of here. The barrow at Barnashrahy on the Coolera peninsula looking west to Queen Maeves Cairn on the summit of Knocknarea.